In this part of the world, cats were big news last week. Yep, domestic moggies made the headlines. For the benefit of the Americans, let me explain. The first story came from the UK where a woman put a cat in a wheelie bin. She was caught on CCTV and later apologised. However she qualified her apology by saying “it was only a cat”. The second story concerned a moggie from Malahide in North Dublin who decided to board the DART (rapid transit system) at her local station and travelled into the city. There was taken into the care of the DART staff who tweeted her story and her family were located and a renunion was arranged. But back to our lady in the UK – “only a cat” she said. As if there was such a thing as “only a cat.” Cats are sublime creatures. I know. I have shared my life with cats since the day I was born, quiet some time ago. The cat heritage comes down my maternal line. My mother always lived with cats; I must find out if my maternal grandmother did too. Often I explode in the front door, laden down with bags, harrassed and mithered, only to be met by the sight of Fat Cat stretched out on the hall chair, catching the sunlight. He opens just one eye to acknowledge my presence. Above his head is a giant thought bubble which says “what’s the fuss? Chill woman!” in a voice reminiscent of the old Caramel Bunny. 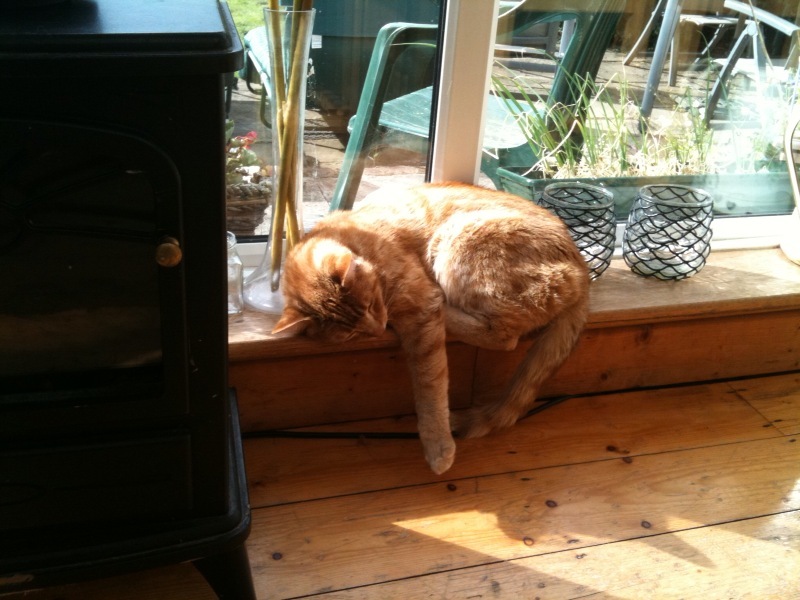 Then he drifts off back to cat dreamland and I arrive into the kitchen wondering which of us is the more evolved species. But it only an inexperienced cat woman who thinks that cats sleep all day. Sure they sleep a lot but cats have another habit which occupies many hours in the day. That’s looking out the window. They ponder the weather and also take huge interest in the neighbours movements. What are they thinking about as they gaze out the window, I wonder. But the very best thing about living with cats is that point when you gain their affection. Unlike dogs, whose love can easily be bought, cats are aloof and independent. So that when they decide they like you, it is the most precious and wonderful gift. Once you obtain the love of your cat, you have a friend for life. A soft, warm, wise and comforting cat. “Only a cat” indeed, as if there was such a thing! Bravo! Bravo! People say such horrid things about cats and it pains me so. It always seems a cat lover is in the position of constantly having to defend cats because of their crimes of not-fetching and not-playing-dead. Poor cat in a wheelie bin, people are so cruel. I have only ever had a one-seventh share of a cat but I can understand their attraction and serenity they provide. I love cats but unfortunately my daughter is highly allergic. Or I would have one gracing my home. That woman who tried to throw away a cat must be a horrible person to do that to any living creature. I will kill flies and mice however. I loved reading this – you have totally hit on why cats make a house a home – especially that last paragraph 'when they decide they like you'. It is a terrific feeling, isn't it? And I also love that picture – what a fantastic ginger cat! He or she obviously decided that was the perfect spot for a nap-attack. Totally agree about the wonderfulness of cats! A cat took up residence with us seven years when we moved in and she's wonderful – she has an unbelievable understanding of Murray and will allow him to do anything with her – the rest of us she barely tolerates and will claw at will. But we love her so much for her understanding and patience with Murray! “I keep my readers entertained when writing blog posts.” This is what you said on my latest post where I asked the question, Is blogging really writing. Well, it IS writing, and excellent writing, in your hands. This post has kept me entertained and interested. And it recalls memories. My youngest daughter LOVES cats; she has three. She also has two adorable jack russell terriers. I have come to like dogs; these two are so lively and loving. Yes, cats seem aloof, but you have captured their spirits so well here. My daughter Jen loves cats the most; she had a Silver Persian she just loved. She called him Perseus and also Babby. She had to give him up when my husband and I divorced and we moved east; she'll never forget him. Oh, the cat stories! Thank you for a great post!! Hmmmm! We have all heard the comparison – treat a dog well, and he thinks you're God – treat a cat well, and it thinks it's God…… I wonder how true? TOTALLY agree, Barbara! That whole wheelie-bin thing was outrageous. I couldn't believe someone couldn't actually do that – and then make such an explanation! Beautifully said! I ADORE my cats and to think I once thought I wasn't a 'cat person' crazy! By the way, I forgot to say what a beautiful photo that is! It's quite shocking how cruel that woman was, imagine if she had children? Imagine if no one knew what she did. I enjoyed your post but at the same time – cats? No, never! A particular episode of Tales of the Unexpected put me off for life! I couldn't believe it when I saw it on the news. Putting a cat into a wheelie bin? Seriously, some people! However, while I do like cats, I'm more of a dog person, I think. Hello friends.. I am back from a little break in Kilkenny (again) and catching up with blog posts etc. Well glad to see that this 'Cat' post hit such a nerve with many! Hi Maria – thanks for liking my post altho I know you reserve judgement on cats! Brigid – you own one 7th of a cat – explain? KarenG – not surprised you like cats. Hi Jayne – glad you like the photo – that is Pasqua – a shy and delicate soul. He had a rough childhood with a bad car accident which has left him with a crooked mouth and gimpy leg but he is a sweet heart! Jan – what can I say! A Christian Scientist dog and atheist chickens – there is a story there! Hi Clive – welcome back from your travels. Cats are so tuned into people's energy. So not surprised your moggie is great with Murray! Cats deal with people's souls and hearts! Hey Ann – thanks for commenting – so nicely! Padraic – totally true about Cats. They know they are wonderful! Hi Talli – yep but I kind of feel sorry for that woman now. She was almost public enemy no 1 in the UK where I have to say you love your animals! Hi Susannah – and how are your moggies? I miss their adventures on the bus. Do they? Niamh – I am sorry you were put off cats. But then again I think some visitors to my home were put off cats by meeting mine! Olive – does the world break down to cat people and dog people? Think it mite. Love my dog but dont think I would live without cats! I would love a cat, I use to be wary of them…but the way you describe them to be so cool makes me want to get one!